I am gratified that the book has gotten very favorable reviews. Here are links to a couple of recent examples: this one from Landscape Architecture Magazine, and this one from Landscape Journal. As some of you may know, I have been working on developing basic principles for sustainable community design for over 20 years now. This book is my attempt to boil down all that work into one easy to access but still useful volume. Over the years I became more and more convinced that having a workable and agreed-to set of sustainability principles was crucial. We have tried for many years to pare these principles down to their fundamental essence. It was quite a challenge to arrive at principles that are both very simple and, at the same time, supported by enough hard data to be credible. This is why I settled on the dual content strategy for the book, where each page has an easy to understand narrative, but also contains supporting data and a host of additional resources for those who appreciate more backup. Most of our reviewers have noted with approval this novel approach, and I hope attendees at the November 28 reading will also find this useful. There will be books available for purchase at the event, and they are also available on line. For more info about the book please contact me at p.m.condon@gmail.com. Patrick M. Condon is the James Taylor Chair in Landscape and Liveable Environments at the University of British Columbia. Professor Condon’s Seattle reading is presented by VIA Architecture. 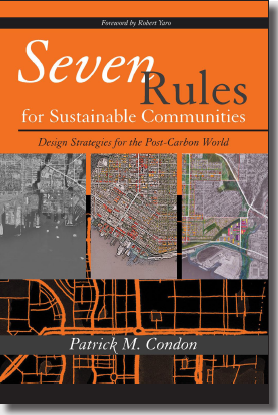 I would love to read about those Seven Rules For Sustainable Communities.